The capital city of Titania. Pronounced H' zhem. Hjem is located along the coast of Titania, on the Fimbrian Ocean. It is north of both Klippebror and Fen Byen. There is a major tributary winding through the southern part of Hjem which separates the southern suburbs from the ports as well as much of the central part of the city. Like a majority of Titania, the climate in Hjem is temperate and the land is rocky, with many low mountains and hills. Hjem is one of the oldest and the first established of the modern cities in Titania. As a citadel, Hjem was established in the late 14th century and quickly became the heart of commerce and foreign trade in Titania, which also made it one of the wealthiest citadels. This wealth allowed rulers to expand the citadel and its military outreach. This became useful in the early 1500’s, when constant war perpetuated such cultural and political instability that many who resided in the outlying villages -- and even several nomadic tribes-- flocked to the citadels for safety. Hjem was the favored refuge due to its well-established ports and the outspoken and determined intentions of the King Alef, the last sovereign ruler of Hjem, to end the wars and unite the kingdoms. It took nearly a century and several political reforms for Alef’s vision to become a reality. However, when Titania was united in 1657, the leaders chose his fortress as their headquarters, and also because of its cultural (both foreign and domestic) significance and well-instituted military command, Hjem was established as the capital city. The hub of the city is just inland of the ports, and is home to most of the government buildings, schools, and historical buildings. The headquarters for the Council of Elders is located in the oldest building in the city, Athal-bjorg, the fortress which was once protected the early citizens of Hjem, and was also the home of King Alef. Also located in Athal-bjorg are several smaller government offices, a National Cultural Museum, and the National Library and Archives. The central military command, though not located inside the castle walls, is located not far from the government offices. The University of Hjem, now the largest public university in Titania, was first housed in an old manor near the south of the city, and was subsequently expanded upon along a half-mile-long stretch of river, and many buildings bridge the water. The university is internationally renowned for its programs in marine science, biology, and naval engineering. At the historical geographical center of the city is Langley Park, a large public park which has several walking paths, wooded areas, large open lawns, and a duck pond which is used for ice-skating in the dodar months. Since it is such a central location, it is also home to many public events and markets, including the Ojethmar (literally meaning “diverse treasures”), a huge, permanent, open-air market which sells a vast variety of things ranging from food to furniture to art to household necessities, etc. not only from Titania, but from all over the world. The fastest way to Hjem is by sea. There is a large span of docks along the coastline of the city which are dedicated solely to passenger ships and personal, non-trade vessels. There are also airship ports inland on the western borders of the city, though many of the ports do not accept large passenger ships. One of the largest train depots in Titania is also located in Hjem, and there are trains to and from Antiford, several trolley lift stations along the mountains, and all other major depots in Titania. The most popular way to get around Hjem, apart from walking, is via taxi-cab services. Mechanical taxis, which have only appeared on the streets open to the public for less than half a decade, are often used by industrialists and entrepreneurs for their speed and efficiency, while also becoming increasingly less expensive than the stag-drawn counterparts. Those of high society or who wish to appear fashionable, however, choose to ride in stag-drawn taxis because of their cultural significance and because they are quieter and slower than the new mechanical taxis, they are considered more elegant. Hjem’s major industries include: lumber, fishing, and steel. 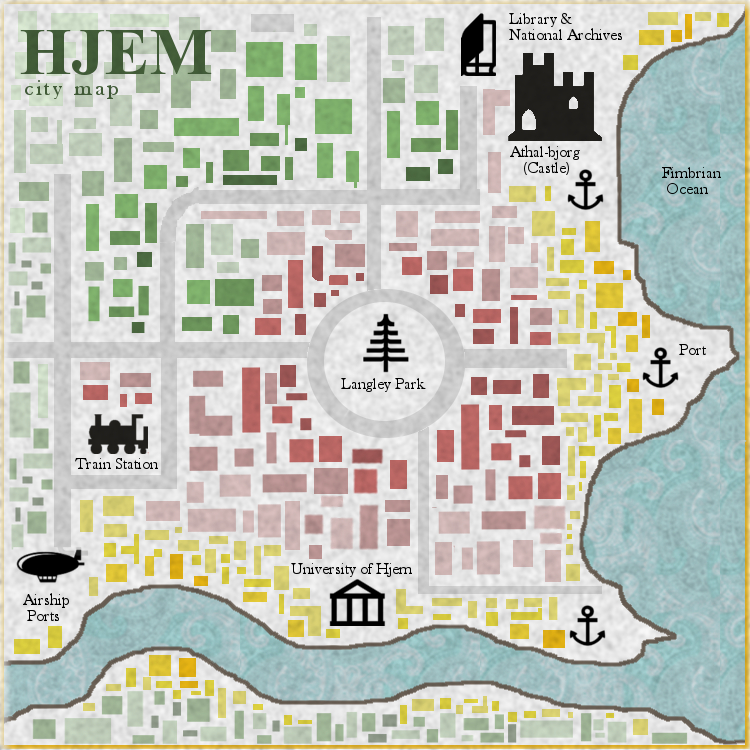 The oil and paper industries also play an important role in Hjem’s economy; however, they do not have as strong a presence in the city. Due to its coastal location, Hjem is relatively easily accessible from Antiford, Kuu, and Paorr. Hjem, therefore, is an ideal center for foreign exchange; this in tandem with well-developed internal security has caused Hjem to become one of the large banking centers for the civilized world.